SAN DIEGO - A Marine veteran continues to give thanks at Fort Rosecrans National Cemetery to those who made the ultimate sacrifice. 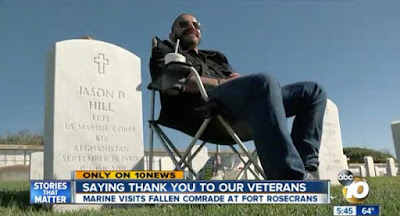 Simon Sandoval visits the cemetery often, and he plays music for fallen service members. While he has lost many friends during the wars in Iraq and Afghanistan, his good friend, Lance Cpl. Jason Hill, is his only friend buried at Fort Rosecrans. "I play a little bit of country music for him since he's a country boy," said Sandoval. 10News was there as Sandoval cued up the music on his phone, adding, "I think he still likes listening." Sandoval said of Hill: "He was one of my fine young men." Hill, a native of Poway, was killed in Afghanistan in 2011. Shortly after his death, his friends gathered at the family home and described Hill as loyal, funny and charming. They said he was proud to serve his country.